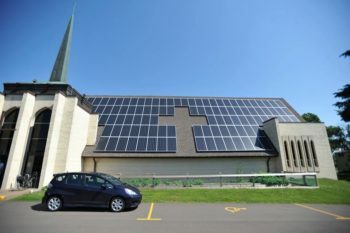 Affordable solar energy is giving families, churches, schools and many others a way to lower energy bills while serving the common good and being good stewards of the earth. However, rooftop solar simply isn’t an option for the majority of consumers who want it – families who rent, have shaded rooftops, or don’t qualify for standard financing solutions, for example. Community solar gives consumers like these a way to go solar, whether or not they own a suitable roof of their own. Join us for a free webinar to learn more about what community solar is, examples of how it’s working around the country today, and ways that you can get involved in expanding solar opportunities for you and your community. The Pennsylvania Council of Churches is a voluntary association of Christian churches in Pennsylvania. Through the Public Witness Ministry, we empower people of faith, through education and skill-building, to make a difference for the common good in the public square, and advocate on behalf of the Council’s member church bodies before Pennsylvania’s legislative and administrative branches of government. United Methodist Advocacy in Pennsylvania educates and empowers United Methodists to engage legislators and other state officials on social and governmental policy issues, as well as being a vehicle for that engagement. Furthermore, United Methodist Advocacy in Pennsylvania collaborates with other faith-based advocacy networks. Pennsylvania Interfaith Power & Light is a community of congregations, faith-based organizations, and individuals of faith responding to climate change as an ethical and moral issue, through advocacy, education, energy conservation, energy efficiency, stewardship, and the use and promotion of clean, renewable energy. Vote Solar is a national, non-profit, non-partisan grassroots organization with a mission to make solar a mainstream energy source. We aim to foster economic opportunity and support a cleaner, healthier environment by bringing solar energy into the mainstream. Vote Solar is not a trade group and does not have corporate members. Since 2002, Vote Solar has worked in states all across the country to remove market barriers and implement key policies needed to bring solar to scale.